Busy urban roads, dramatic ocean highways, lively street markets, peaceful secluded lakes—in Taiwan, you can bike through it all. Over the last decade, Taiwan has invested heavily in extensive cycling infrastructure all throughout the island, and has gradually emerged as a cycling paradise for locals and tourists, amateurs and pros. There are grueling, multiday grinds through the mountainous regions, and leisurely rides through quiet farming communities. 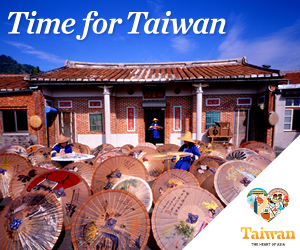 The sheer variety of landscape—mountains, ocean, city, countryside—combined with ubiquitous and easy bike rental opportunities makes Taiwan a truly ideal place to explore on two wheels. Discovering a place by bike profoundly changes the way you experience it. This contrast was most evident to me in Taipei, where we started and ended our trip. After landing in Taoyuan International Airport and driving into the city, our first impressions of Taipei were formed in a car. We then took off to travel the rest of the island, returning to Taipei for our final days, like bookends around the trip. This time, with a perfect sunny morning ahead of us, we opted to ride through the city on bike, and it was only then that I really felt the pace and colour of Taipei in real time. Sitting in the back of a car, I was somewhat removed, insulated from so many sounds and smells of the city—the shouting kids in a market, the bunches of potent Chinese herbs hanging to dry in unexpected alleyways—but being on a bike brought these delightful details to life. I love moving slowly enough to be able to approach a curious street scene, like a shopper angrily bargaining with a fruit stand owner, or a group of monks getting down on the floor of a temple to pray, or a woman in an all-zebra pantsuit admiring herself in a rear-view mirror, and actually see and hear it play itself out a bit before I have to pass it by. My natural hunger for weird and wonderful little stories was immensely satisfied by cycling. Taipei uses the U-Bike system—a network of automated, pay-as-you-go bike rental stations located all over the city that allow you to sign out a bike from one location and drop it off in another. The kiosks are easy to use with your plastic U-Bike debit card, and many are located right outside Taipei’s most popular points of interest, temples and subway stations. U-Bike also has an app that lets you find the closest kiosk on your phone. Taipei’s wide sidewalks, clearly marked bike lanes, and long stretches of paths along the Tamsui River generally make for leisurely riding. The traffic can get hectic, especially given the hoards of scooters and motorbikes, but cycling on the sidewalks is an easy way to avoid that issue. 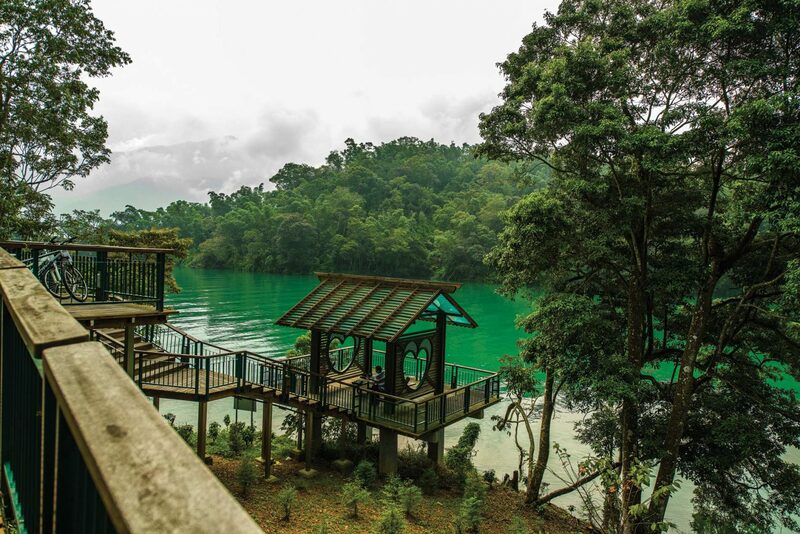 The lush greens of Sun Moon Lake, where you can grab a bike and take off. Cycling can be a fun way to explore Taiwan’s vibrant urban centres, but it can also be a very quiet, meditative experience, a way to move through nature for those in search of perspective and peace. This is the experience we had at Sun Moon Lake, where we rented bikes directly from our hotel and headed out on an early morning tour around the lake. There’s a beautiful paved 29-kilometre bike trail that undulates gently, past benches, under bridges, shaded by a thick canopy of trees on either side. The lake is glassy and still, and it doesn’t take long before we’re enjoying a restorative silence, just the squelch of wet leaves under our tires. Sun Moon Lake also has bike paths leading into its nearby towns, and you can follow a quiet county road alongside rivers and forests all the way into the surrounding villages and communities. Taroko National Park also has some excellent day biking; it’s numerous routes vary in difficulty, from a straightforward park trail to a relentless bonanza of switchbacks to the utterly insane ride from the gorge to Hehuanshan, which has you climbing from zero to 3,275 metres over the span of just 86 kilometres. It’s worth noting that Taroko Gorge is especially a weather-sensitive spot—typhoons are common, and the park staff will often seal off parts of the region if they deem it unsafe to ride there. Giant Bikes, a world-renowned Taiwanese company, has a strong presence all over the island, and they’re probably your best bet for multiday cycling trips. They’ve got good day rates and high quality steeds. Long distance trips are all the rage on the East Coast, and Highway 9 or 11 between Hualien and Taitung, are very popular routes—challenging, especially in the more mountainous areas, but at 180 kilometres definitely doable in a handful of days. Any ride is a reward in itself, but I’m certainly not complaining about the fact that Taiwan’s got more than 100 hot springs hidden all over the island—yet another incentive to get pedalling.